Random Anny .Com: Don't look under the sink! Don't look under the sink! Today's assignment is to clean out under the sinks. Uh oh. When we moved in a year and a bit ago my husband and I shoved stuff under the sinks and kinda forgot about it. 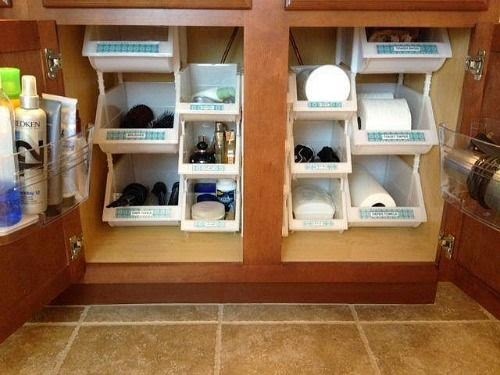 I was trying to remember what we keep under there and asides from my hair products and retainer cleaner I couldn't! I didn't even know those cleaning supplies were on the top left shelf! I see a Scrubbing Bubbles shower cleaner we can't use in our shower without changing the showerhead AND a refill for it! I see my old Clearasil dispenser, which would be great except the refills aren't being made any longer. Most of this stuff should be kept in the bathroom but the way we're going about doing it is chaotic. The last time I used the hair dryer I couldn't figure out where to put it back so I consciously decided to just throw it in and hope nothing spilled or broke! Most of this came from the bathroom in my old house and I just didn't know what to do with it. There are a few things I could throw away but its mostly serving as storage for stuff I don't use as often and/or until what's in the sink downstairs runs out. 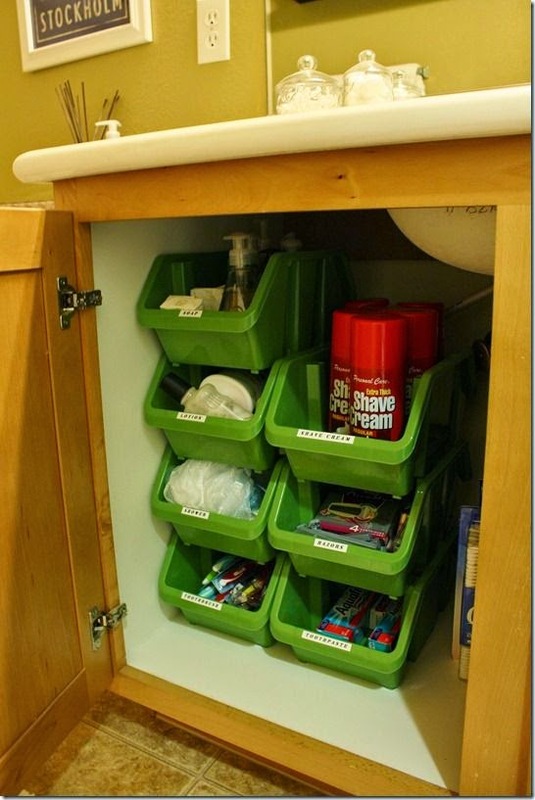 I turned to Pinterest and at first organizing ideas all fell into the "shove in into covered bins" school of thought. Storage containers with lids are my kryptonite. Many a leftover has gone to a trashcan because I can't forget those things open and contain stuff. There isn't as much vertical clearance between containers but I can live with it. Even though some of the January Cure assignments are tough (I still haven't cleaned every floor in the house) I really appreciate how they ask us to deal with overlooked spots in our homes. These small little black holes create stress and avoidance. Consider me - I've decorated the house for at least six separate holidays and change curtains seasonally. Until today I haven't looked at the undersinks and really thought about how to increase their functionality and practicality. A trip to Ye Olde Dollar Tree is in order and an update later on. I like the one using the Dollar Store bins. I hope you find some and show us how it turned out. I might just have to redo mine, too!